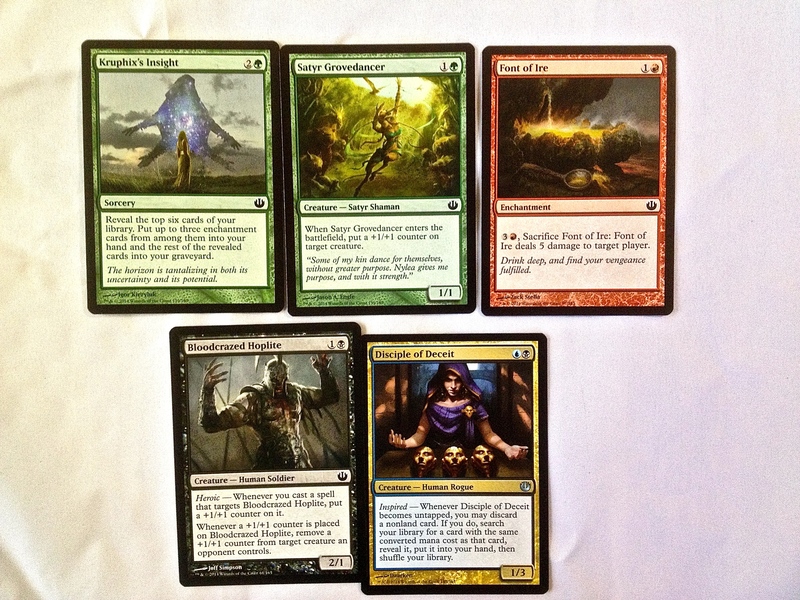 When I started playing Magic the Gathering, I had a vague idea of what a “set” was. I didn’t get the full on meaning to the game. “Return to Ravnica” and its two companion sets, “Gatecrash” and “Dragon’s Maze” were the sets that truly absorbed me into the game and taught me that there was a new and an old in MTG. As I accrued more and more of these cards, I began longing for the day that the “Innistrad” block would rotate out of Standard…I was at a disadvantage…I didn’t play seriously when those sets were released, so I didn’t have “Cavern of Souls” or “Geist of St. Traft” or “Olivia Voldaren” to stomp my opponents in the ground. True, I did have some cards from the sets, but I was a learning player. And I knew when Innistrad rotated out, “Theros” block would be the new thing, and I wouldn’t have this problem so much anymore…instead I could do like my really good opponents and build stadard decks as they are meant to be built, with maximum resources. 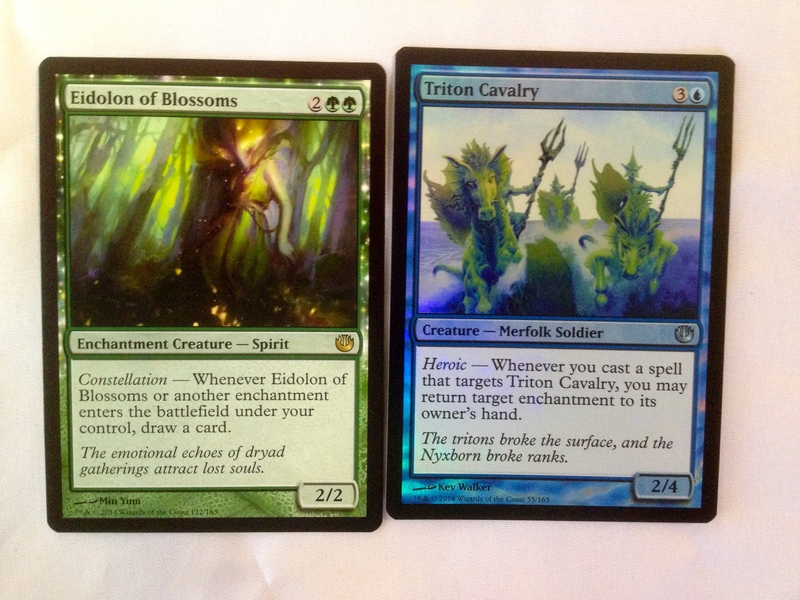 But as much excitement as I have for the release of “Kahns of Tarkir” next week, I find it bittersweet. 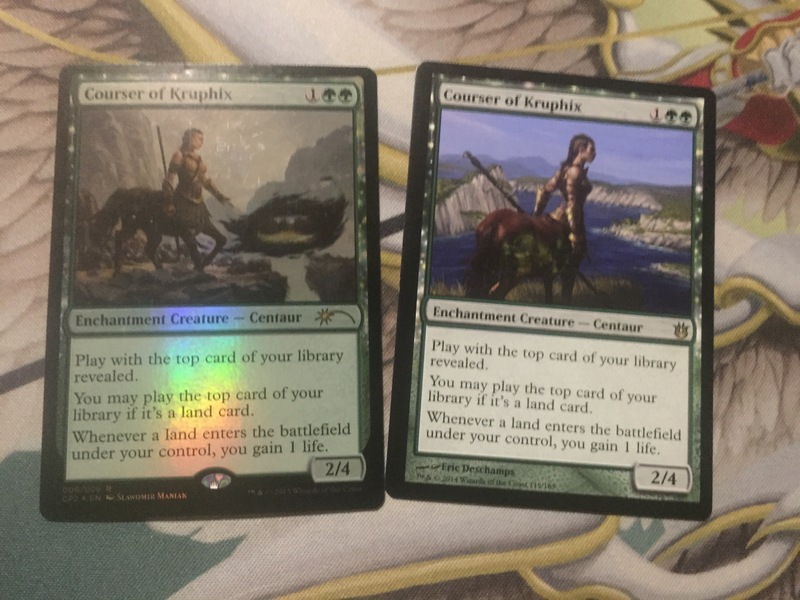 the RTR block has been good to me, and now that I am having to retire a bunch of my cards, (at least for Standard), I am reflecting on what the cards mean to me and what they have taught me. 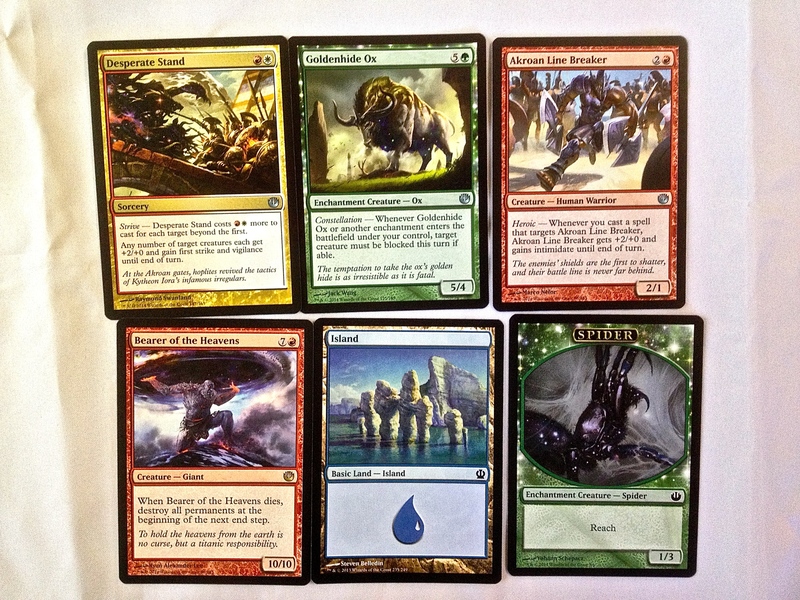 I will also be talking about “Magic The Gathering Core Set 2014” or “M14” cards that are rotating out as well. Below I will provide a photo, and a “tearful goodbye” paragraph. Enjoy! 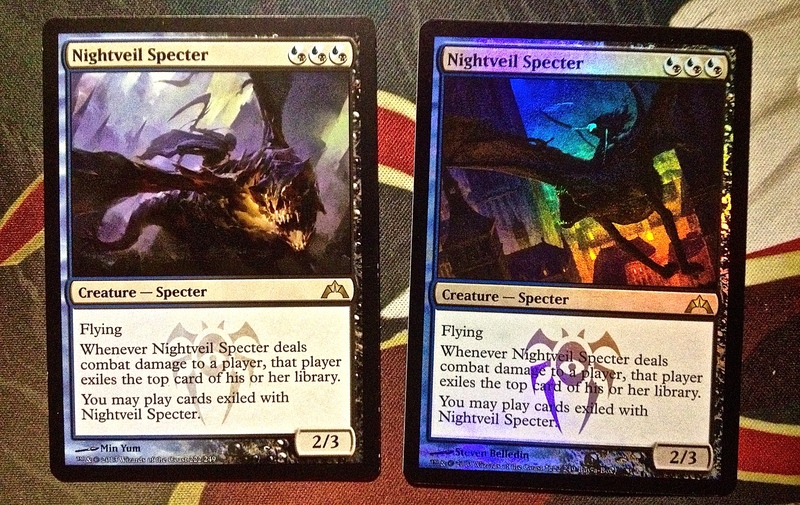 Vampire Nighthawk had me spoiled…She was one of my favorite cards to play when I began playing this game. 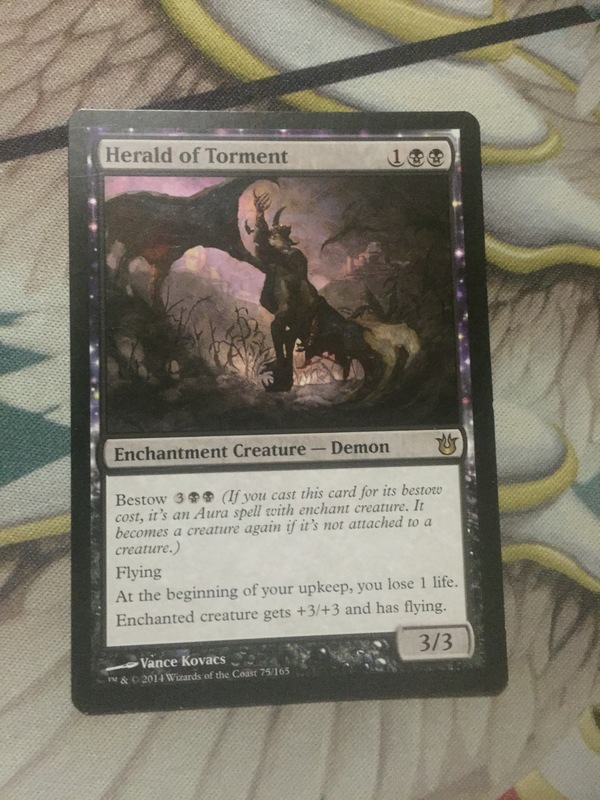 A three drop with flying and other abilities, in black, is just perfect! The Nightveil Spector was a good replacement for the Nighthawk. This card was good, and when Theros came out, it kept getting even better! The Nightveil Spector was easily the card I played the most over the last year, besides “Gray Merchant,” who was part of the reason this guy was so good! I have a story about this involving “Nykthos, Shrine to Nyx.” Here I am, playing Mono Black devotion, with two Spectors on the field. I steal my opponents card with the spector, and instantly think…”Dang. I can’t play it.” But then I realize…How could I forget? The Spector is also blue! So I charged up my Shrine using the blue devotion supplied by the Spector, (who just stole the card…) and played Fated Infatuation…a Three drop spell that lets me copy another creature and then scry. This moment won me the game! Another insanely good card. And a card that seems to have been forgotten in the current metagame. Too bad for everyone else. This troll is a real fighter. On turn three, when your red opponent thinks he can burn the troll before you have enough mana to regenerate, BAM. 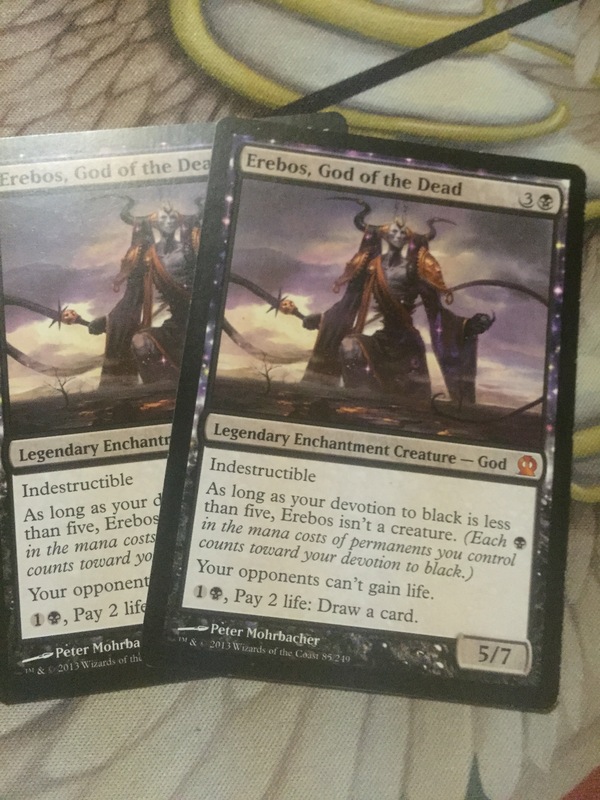 You just put your Desecration Demon, Jarrad Lich Lord, and Erebos God of the Dead in the graveyard to give him counters…an alternate way of saving him! Then on turn four you have a troll that can swing for five..WITH TRAMPLE! This combat trick drew awe from many newer opponents. I always played four copies of the troll in my “Junk” deck. I would even ditch trolls to pump trolls. This guy is a game winner. I never got to draft one. But I’d bet you in draft this guy is unstoppable. I’ll miss you, Lotleth Troll. 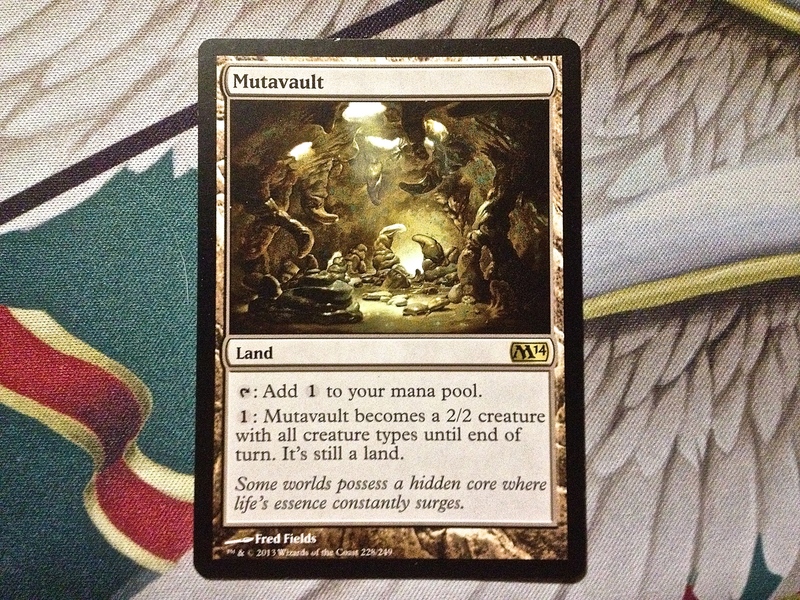 May the “Abzan House” find more ways to help you out in Modern! 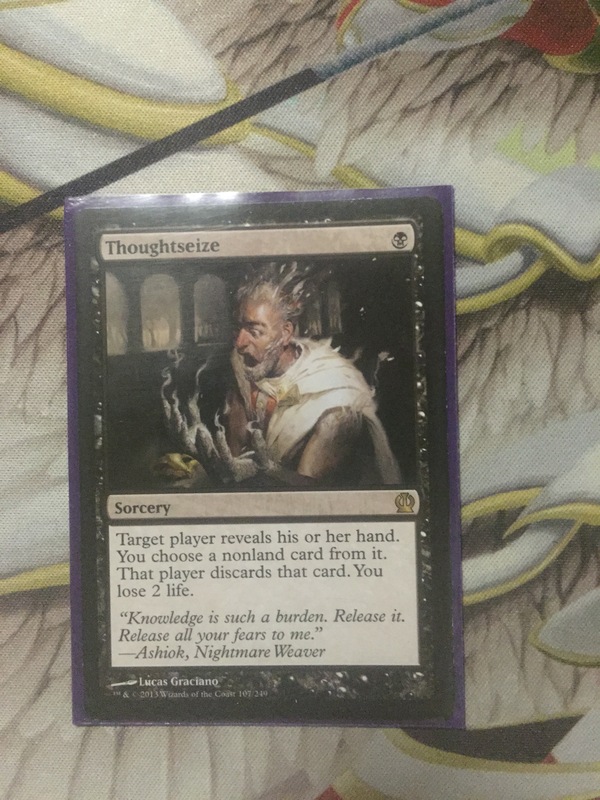 This card taught me about deck thinner…a concept every Magic player should learn. So you have to have 60 cards in a deck…Why not figure out how to get what you need faster…and LOTDR ability to find swamps in your deck and place them in your hand keeps you from having dead draws. I often would use this card as a burn spell also. Her negative ability is basically “mutilate” for one creature. But it is her ultimate and emblem that makes this card crazy if used properly. 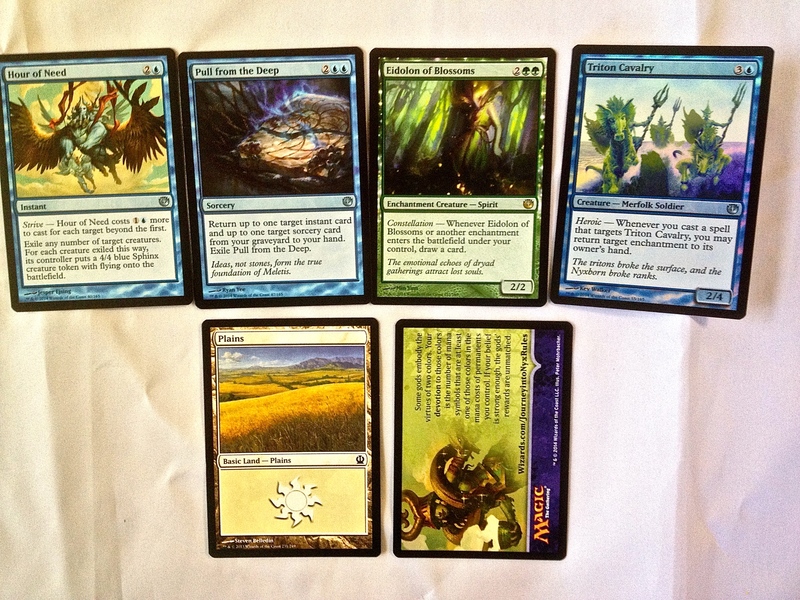 I guess I will have to thin my deck with “fetch lands” or “evolving wilds” (gasp!) from now on. 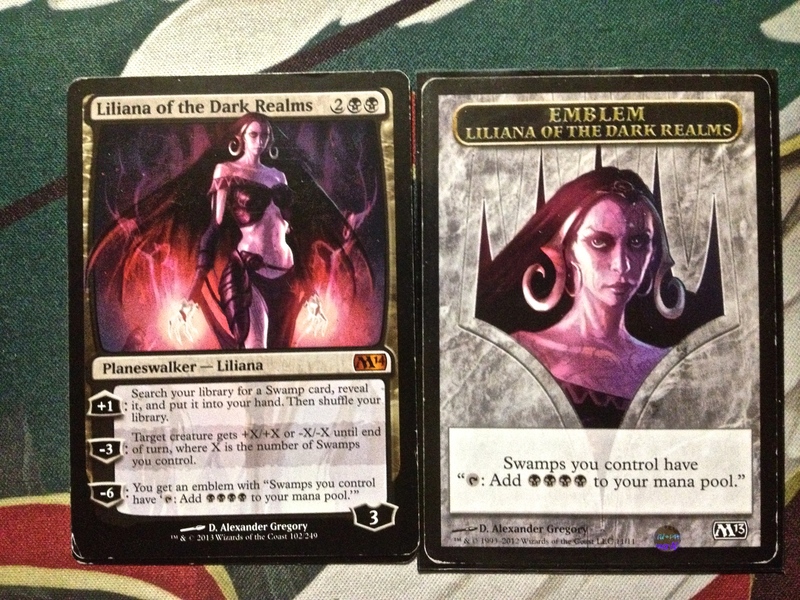 Lilliana of the Dark Realms, whether or not the wizards like you or not (they don’t), I will miss you! Good luck getting rid of that cursed veil! As I moved into regular tournaments, I started to see that usually it was the seasoned players not playing the regular lands. Instead they played special lands…especially “Buddy Lands” and the like. The “Shock Lands” confounded me. 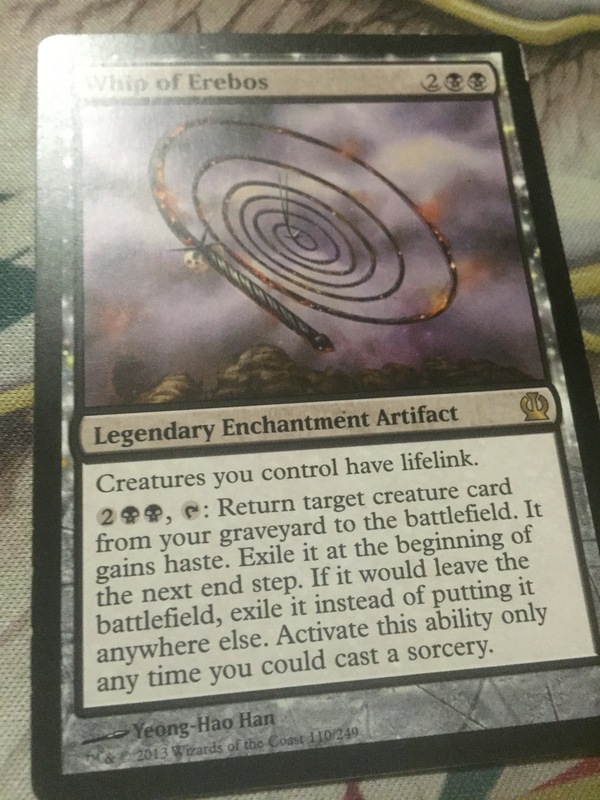 Why would you pay two life for a dual land when clearly it was unnesecary? And there were “Guildgates” which were basically the same thing, but always entered the battlefield tapped. Thankfully this mystery was solved for me as I played more and more MTG. The shock lands increase your chance of having the mana you need available when you need it. Guildgates are just too slow. 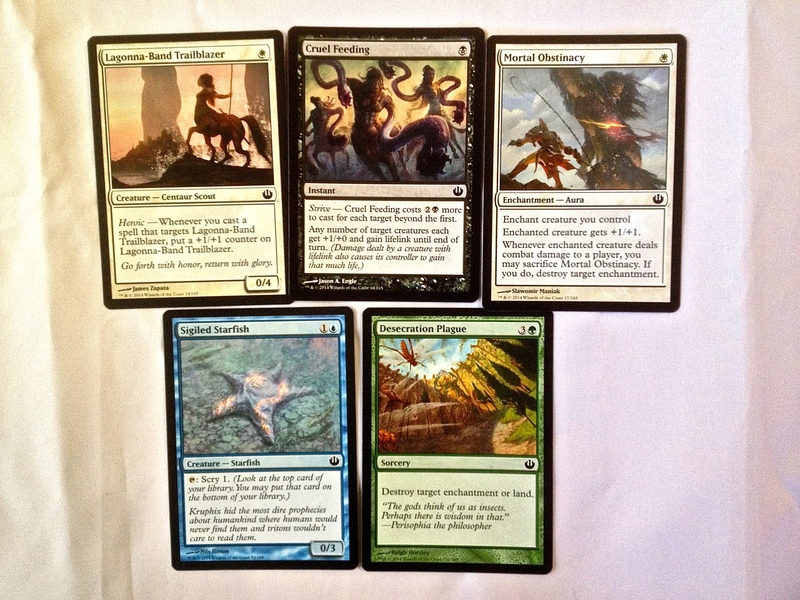 “Buddy lands,” “Evolving Wilds,” Transguild Promenade…these are good for formats other than standard. 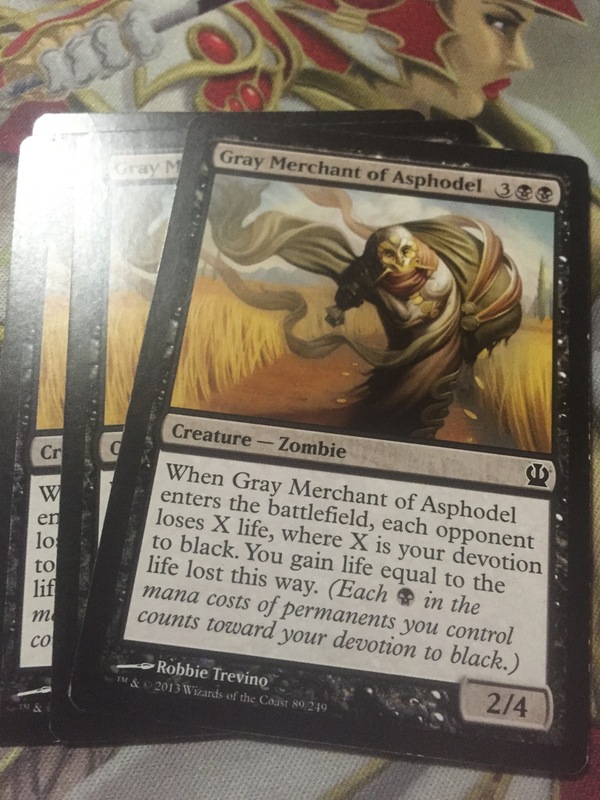 (Sealed is a good place for these) The standard environment tends to be…”fastest man with card advantage wins”. You are technically “behind” a land drop if your land enters the battlefield tapped. The life you pay for a shock land pays off in the end. Shocklands, I will not miss you. You are being replaced with “Fetch Lands,” which will be used to find you in Modern! 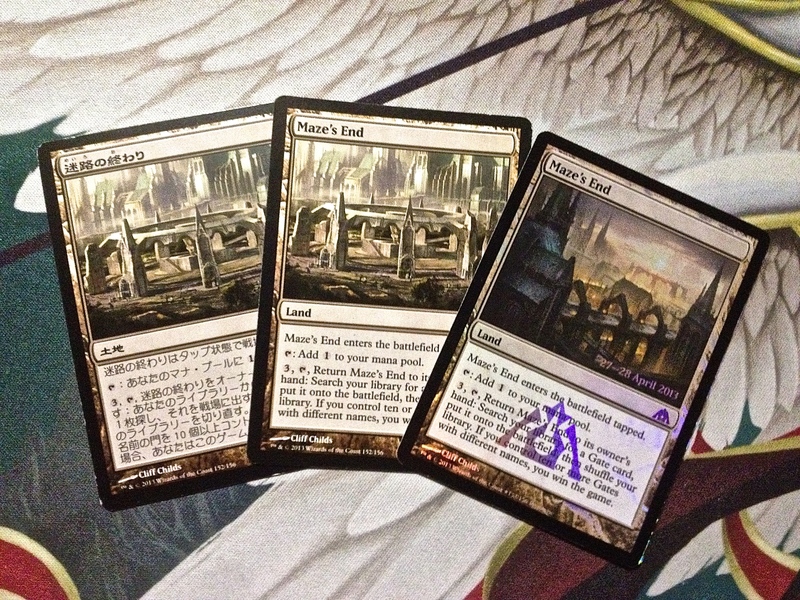 I have three different printings of this card…Sad really. Maze’s End was a gimmick where you could play ten different guildgates, then tap the Mazes End to win the game. See the above entry about the Shocklands to see why this is a bad idea. Oh yeah. You pretty much have to play at least THREE COPIES of the guildgates to make this work, so that’s thirty cards, plus four copies of Mazes End. That’s 34 slow cards. I love this guiy. 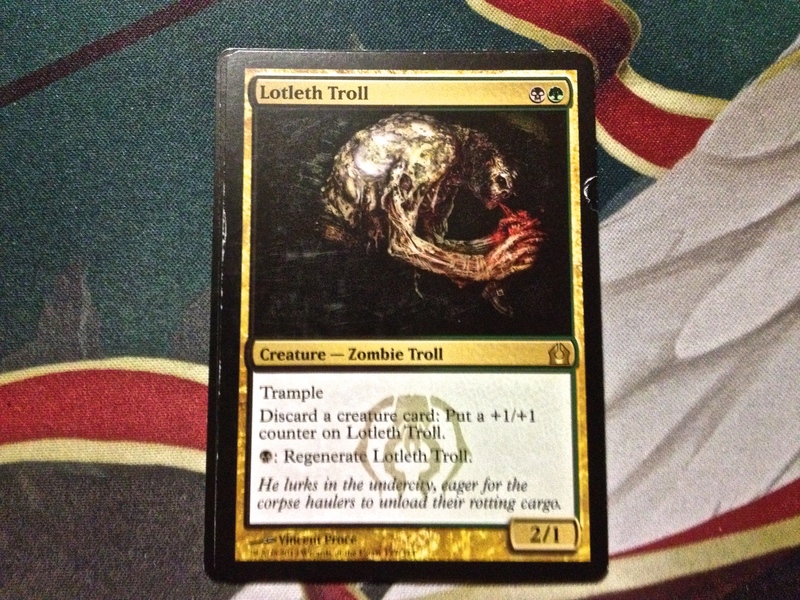 He’s hard to kill and goes nicely in the “junk” deck beside Lotleth Troll. 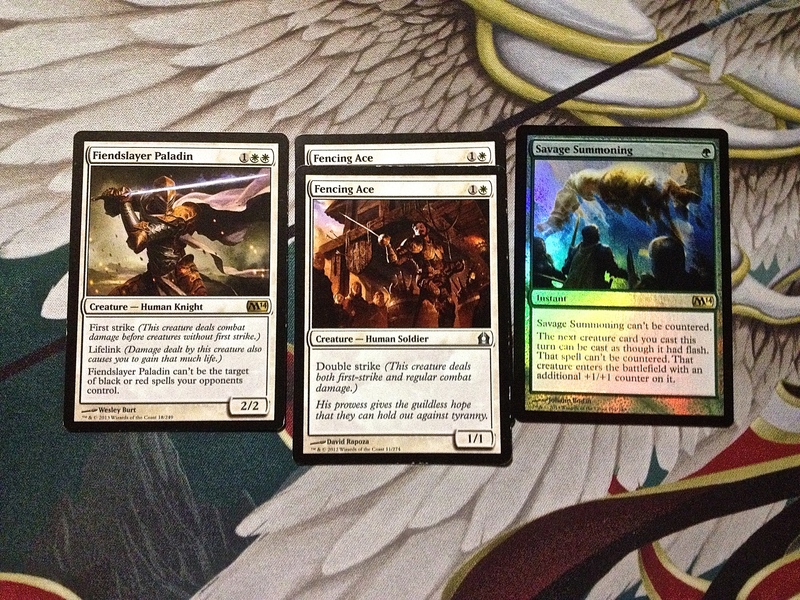 And I have two foils! Jarad can beat you down in THREE DIFFERENT WAYS! Regular swinging (with counters), as a “sac outlet” which you can also use as a burn spell, and as a surprise attack later in the game when you can give up a few lands, and when he comes back in that late game, he will have a ton more counters on him! 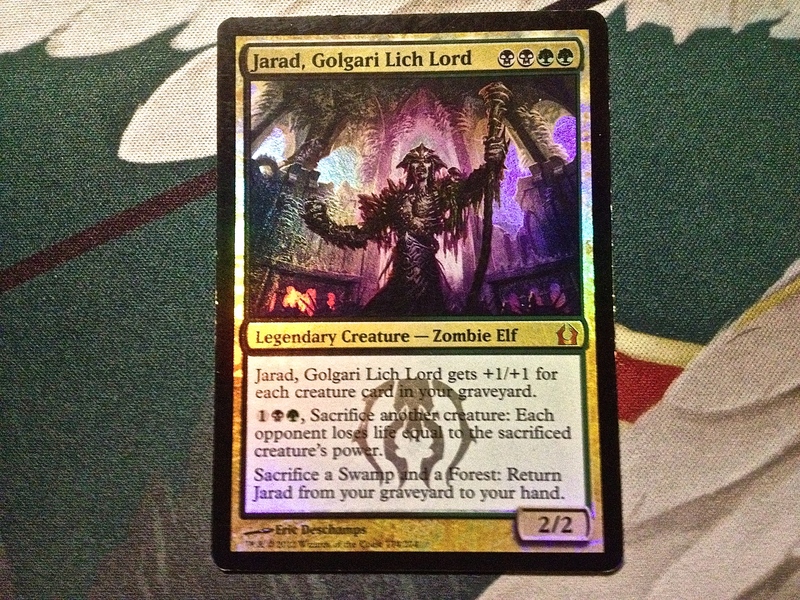 Jarad, Golgari Lich Lord, I will miss opponents just scooping when they see you enter the battlefield the second time. 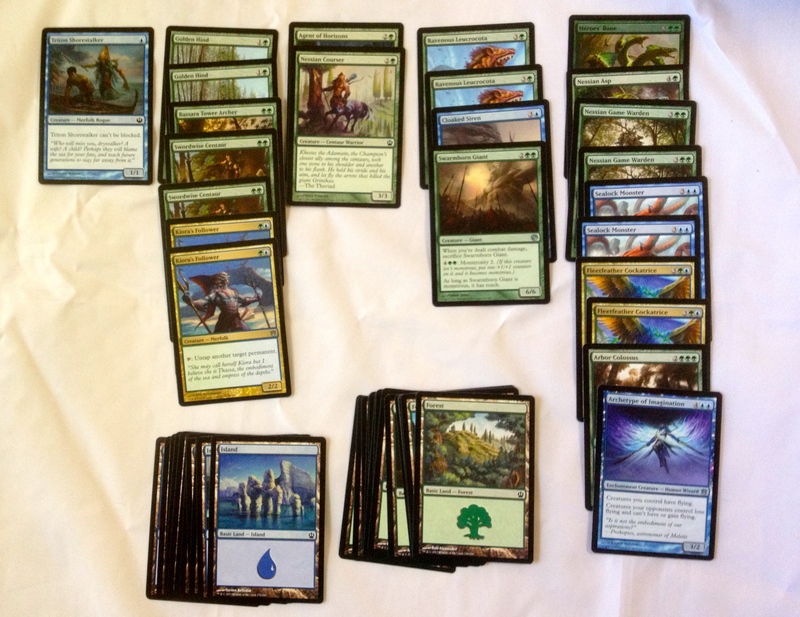 May Abzan house or Sultai be good to you in Modern! 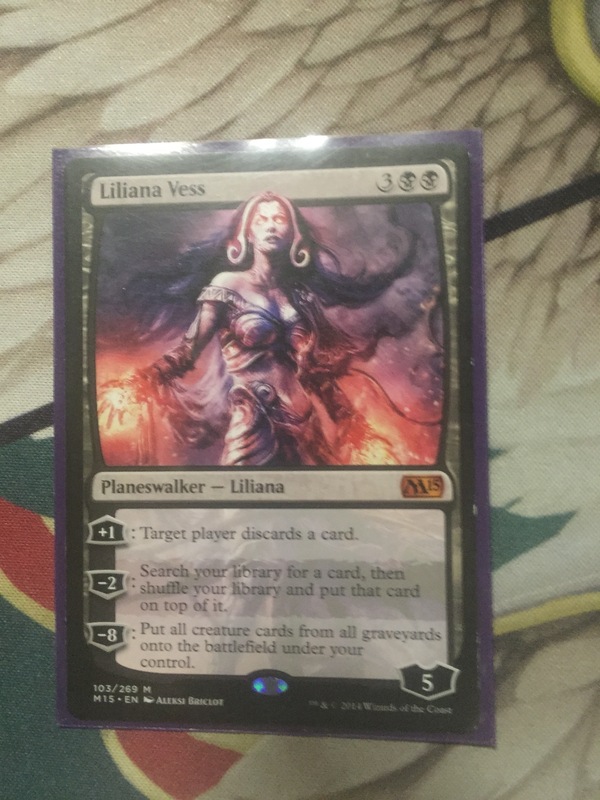 OK, I already mentioned that Lilianna Vess is my favorite card. But truth is I have two more favorites. Grave Titan and Elbrus the Binding Blade/Whithingar Unbound. I mention this because the Binding Blade was my first “demon” card. I was pretty allergic to the idea of playing demons…until I figured out they were game winners! Desecration Demon isn’t any different. (I like to call him “Double D.”) There was a time abut four months ago, that this card was upending everyone’s game with Mono Black Devotion. But before you know it, people figured out the trick to beating Double D here is to just sac something. Sure he gets a counter, but they just bought more time to draw removal. And until Master of the Feast came out, you pretty much could count on people playing this guy. 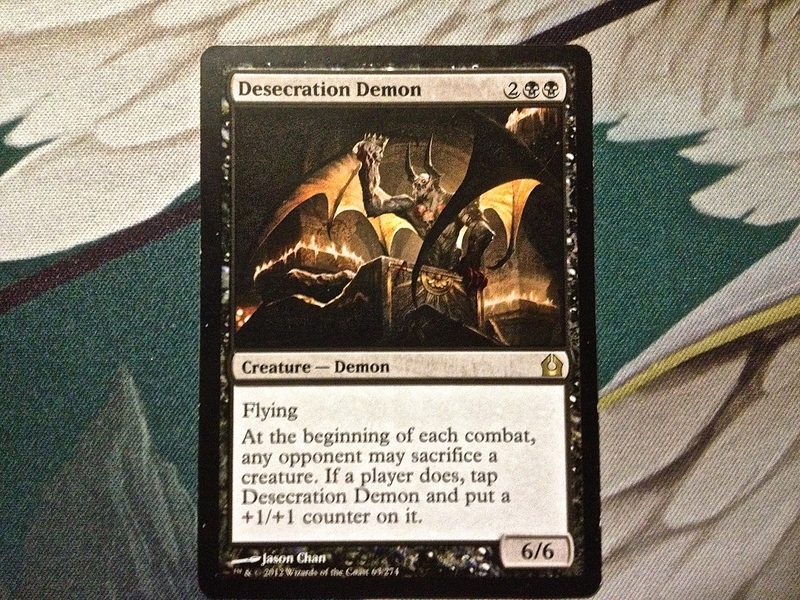 Desecration Demon, I will miss you because you were reliable for awhile. Then I learned something about the meta-game. It is always changing. You really were a fad, like silly bands and jelly shoes. But you are being retired to the binder of rares. 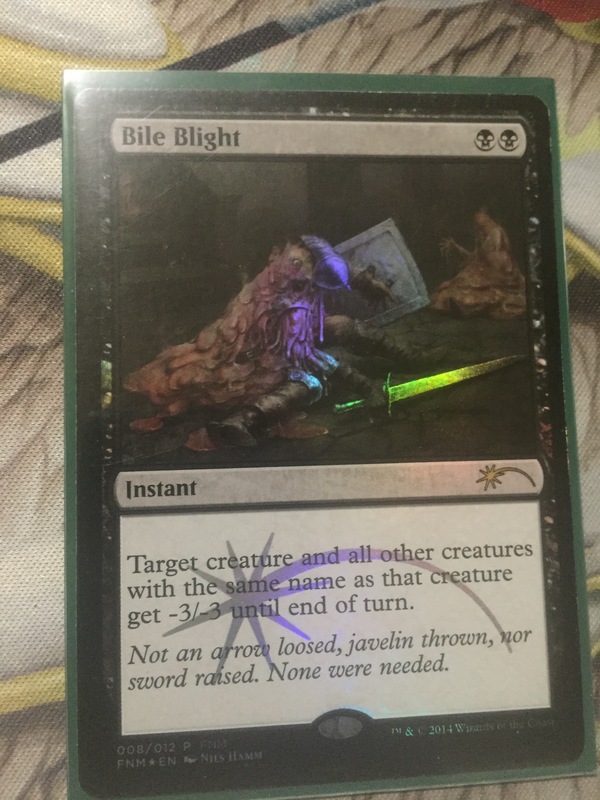 Maybe I’ll trade your foil for a “Butcher of the Horde”! 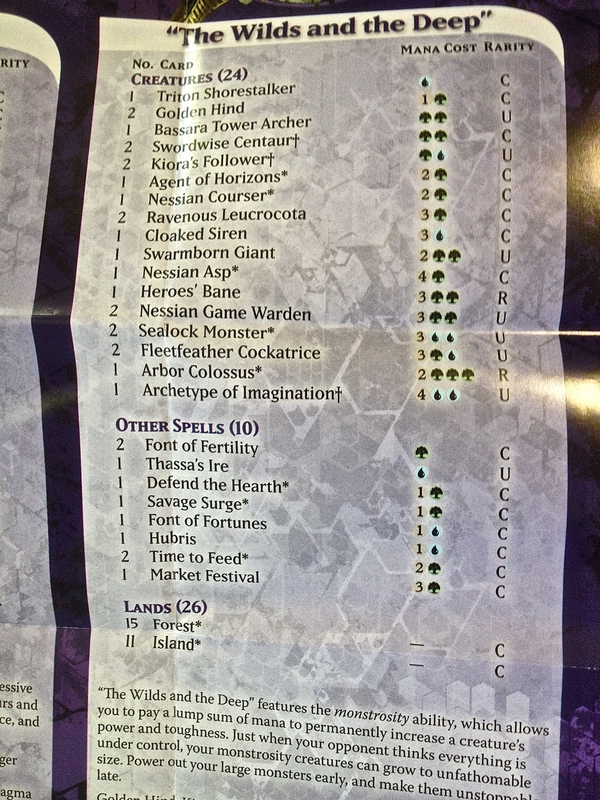 I regularly played Azorius in my earliest standard tournaments. I couldn’t figure out why it didn’t work our for me. I was locking down their creatures. In those early days, full on control wasn’t played so often. So I was trying to quickly arrest their creatures, exile their stuff, etc. To sweep the board would have been a nightmare for me. Nevermind that hasty red creatures usually beat me, or giant green creatures would beat me. Geist of St Traft would beat me. In fact, I got beat a lot. 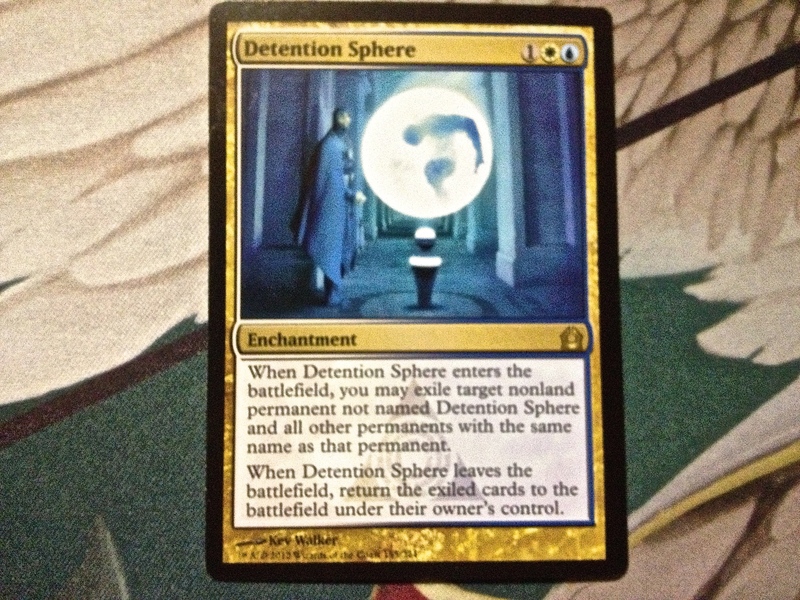 D-Sphere, I will miss you and your controlling ways on the battlefield. You will continue to be beast in Esper Control as a Modern Staple my friend. Because the ace was so slow to start with, I tried numerous ways to speed him up. One way was Savage Siummoning, the green foil you see above. But rarely did that ever work out. You were flashing in one of these heroes before your opponent could respond, then whacking them upside their head with double strike something or another. The strategy would work, except you have to draw what you need at the right time. I remember rearranging one guys face on turn three once. That’s about it. Usually, my opponent would find some way to adjust. If they could just stop the double strikers, then I would lose. Big time. Fabled Hero, I think I am going to miss you because I never seemed to be able to find you when I needed you. Even though you were uncommon, I felt compelled to leave you in my rare binder. You went well with so many others…Two-Headed Cerberus, Fabled Hero, Skylasher, Satyr Hoplite, and more even. You begged to be pumped and enchanted. And I was much obliged. But you just weren’t good enough. Can’t wait to really figure out how to use you some day! 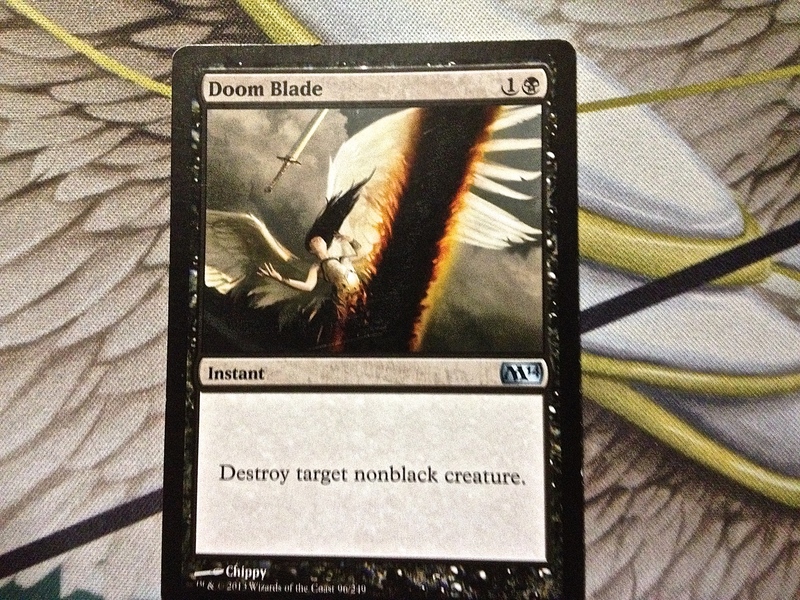 But this card died easily to “eye gauge” A surprise kidney punch if someone side boarded it against mono-black. Maybe I’ll trade the $30 copy. Last time I checked, it still was $30 right at rotation time! I include these two because they became my arch enemy. As I moved to a Mono-black strategy that was getting me into the final rounds of tournaments, I feared these two cards to most. 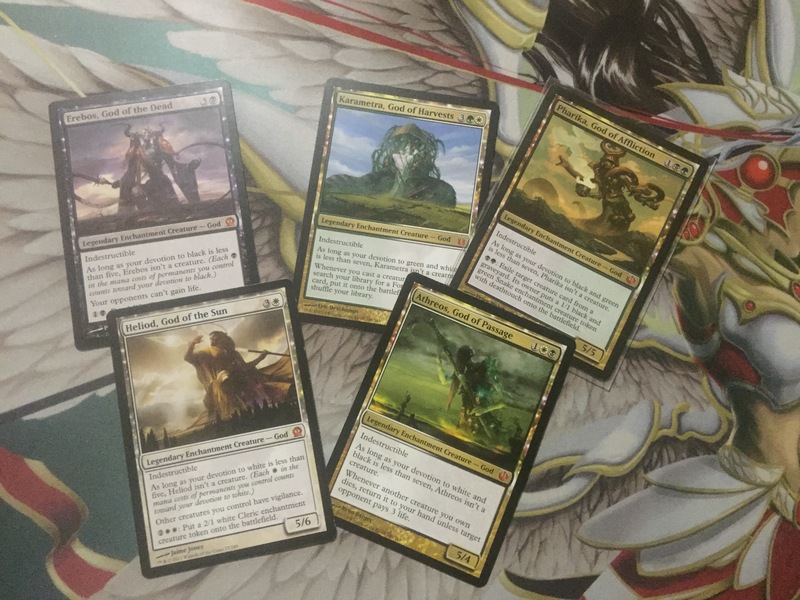 And because Sphinx’s Rev was woefully out of my price range, I couldn’t even try to pull together a mirror match for all the Sphinx’s Revelation control decks that were popping up in response to Mono-Black. 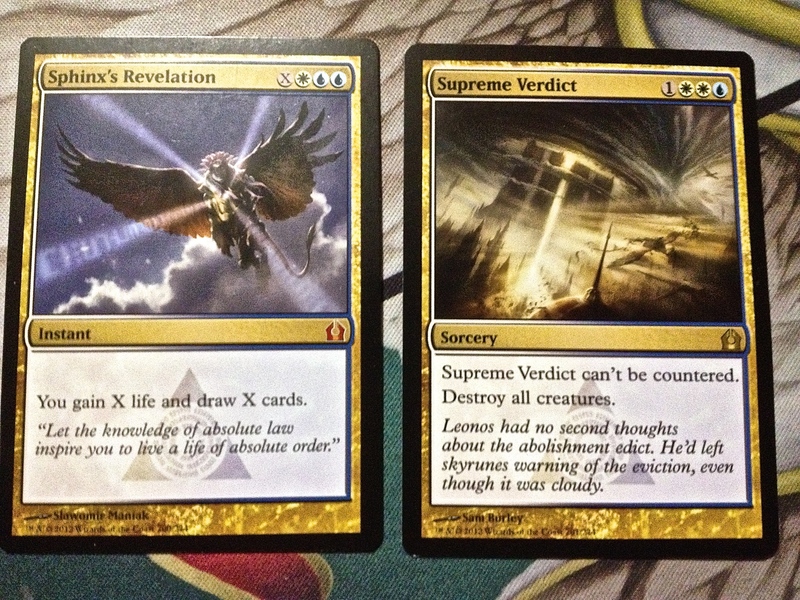 But Sphinx’s Revelation is a card that wins games outright. A control player not only gains life, but draws as many cards as they would like, and this card gets played as an instant at the end of your turn. Too bad for you. They are generally looking for “Elspeth, Sun’s Champion” or “Supreme Verdict.” Then they hit you with that on the next turn. And you are dead before you know. it. 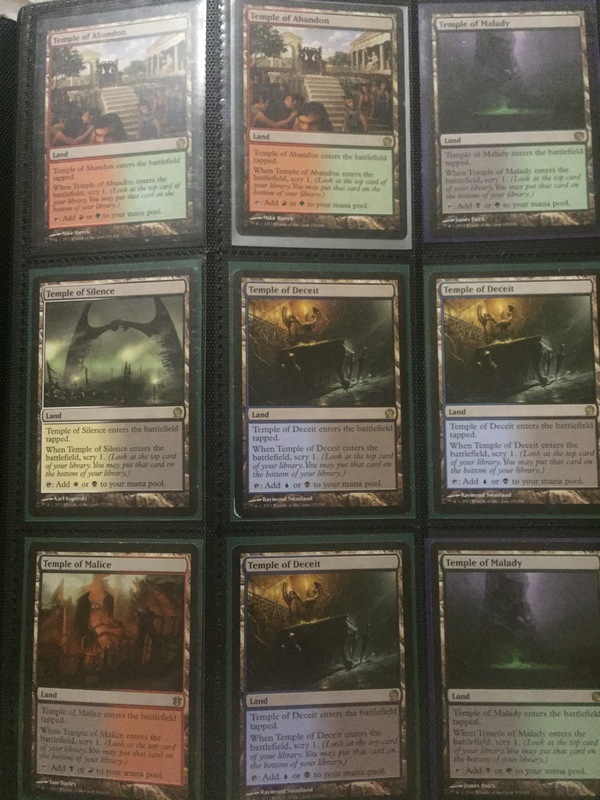 I finally bought a playlet of Sphinx’s Revelation two weeks ago for $8 a piece. Considering it was $40 just about a month prior, i figured now was the time to buy. This card isn’t going anywhere. It will become a staple in all of Magic. I will not miss seeing you across the table, Sphinx’s Revelation and Supreme Verdict. BUT I look forward to a future playing you in Modern! Ah. My first banned card. 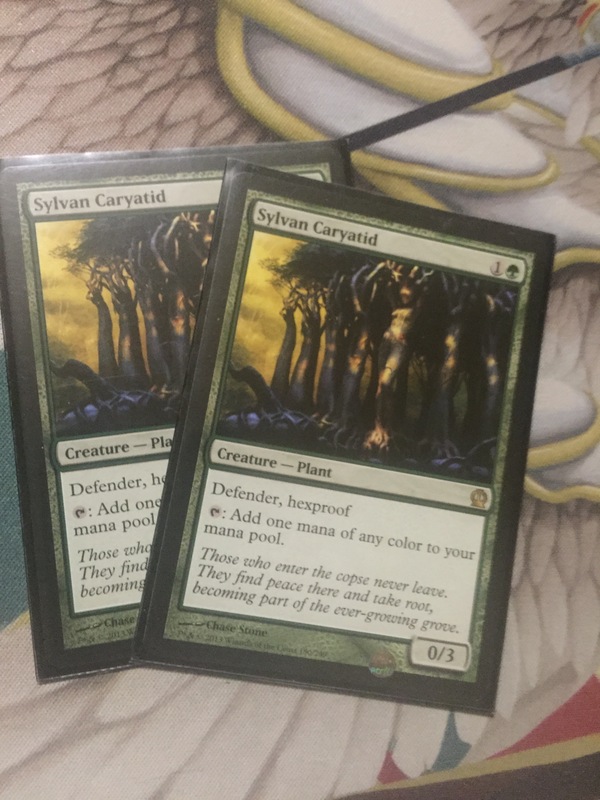 Did you know that this guy was $40 to $60 dollars before he was banned in modern? One drops with powerful abilities ten to be like that. 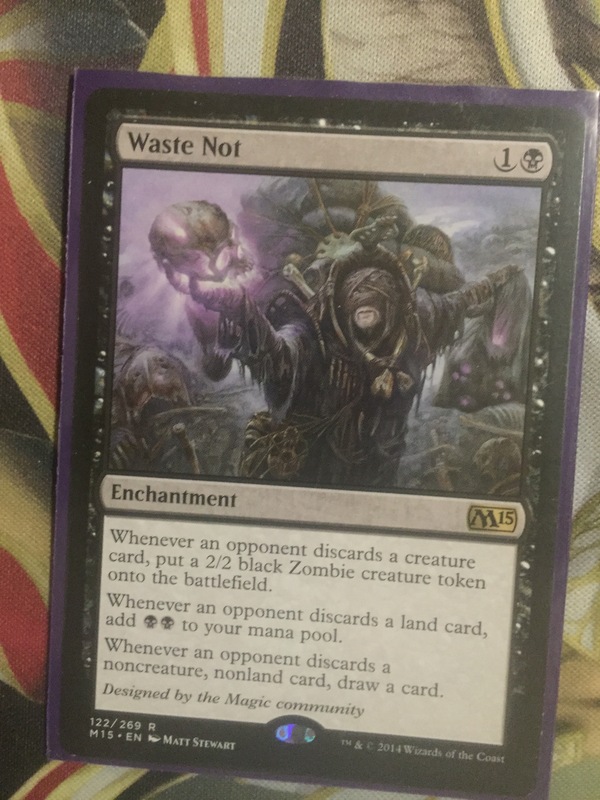 One day they will unban you from Modern, and then I will play you good. You can guess that I used this guy a lot in both Mono-Black devotion and Junk. And you would be right. He is a nifty card. I guess you will take up a spot in my binder after rotation. 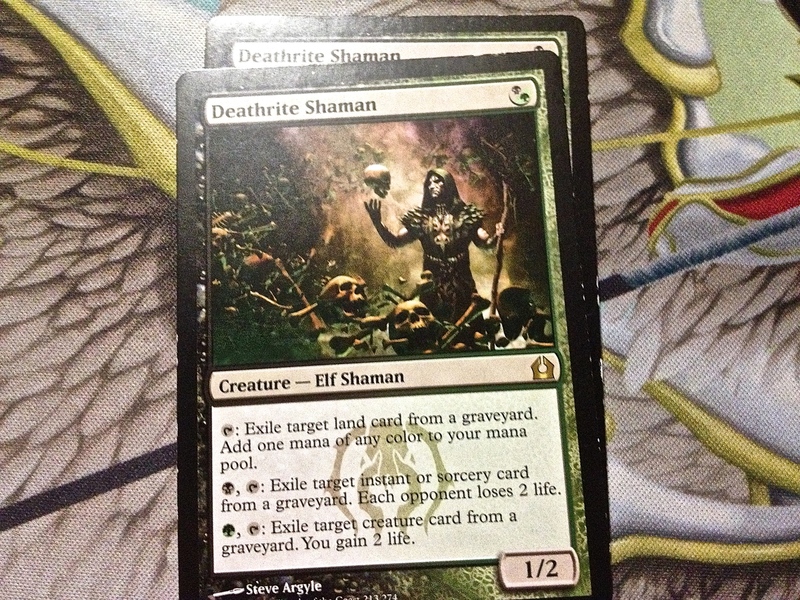 I will miss you, Deathrite Shaman. Here is a card that I learned to play early, hated when they rotated it, and cheered when they brought it back. 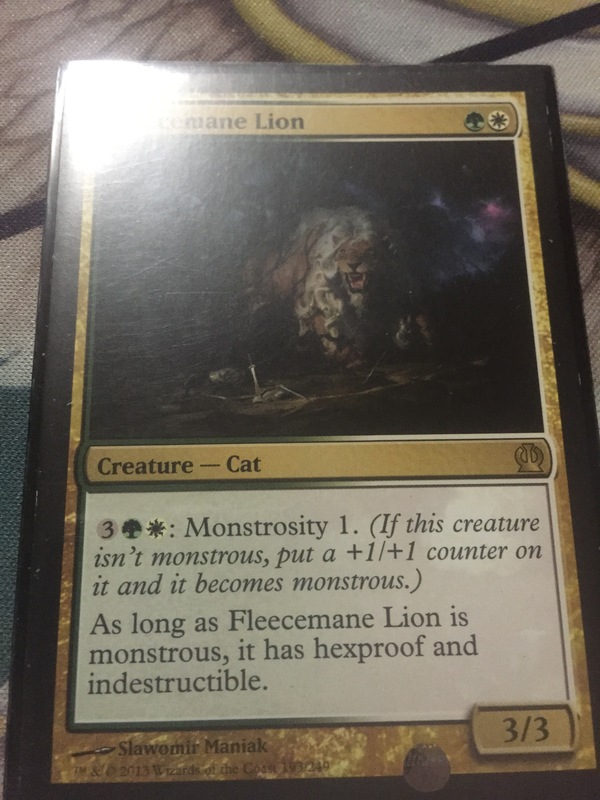 This is the card that taught me to have a sideboard. You didn’t want this in your hand if you were playing against another player who was playing black. But it is good removal against everyone else. In draft, it was also a great card, you get just about ANY removal you can. I’ll miss you, Doom Blade. I wonder if you will be reprinted in the FINAL CORE SET, M16? 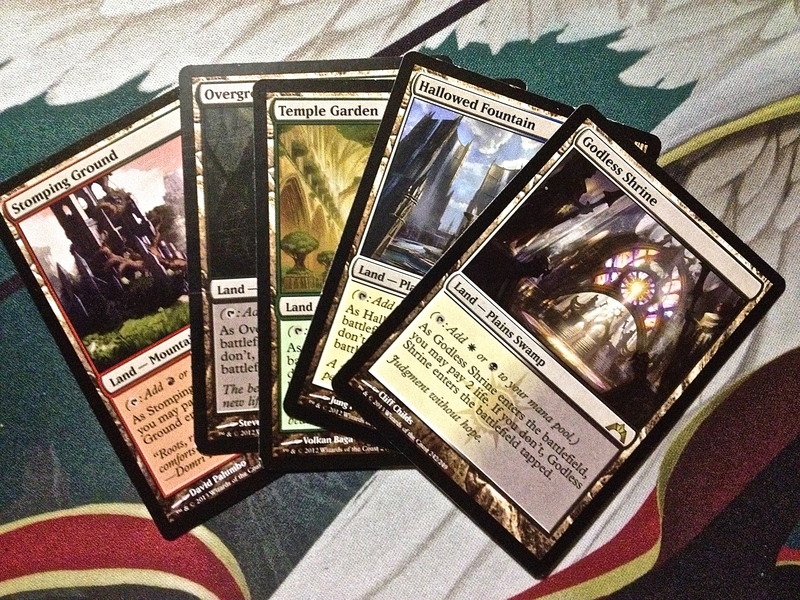 So what cards are you going to miss, oh Hub City Geeks? Let me know in the comments. I intend to begin doing an article like this anytime there is a rotation in the future if I get responses or if I see a lot of traffic here. 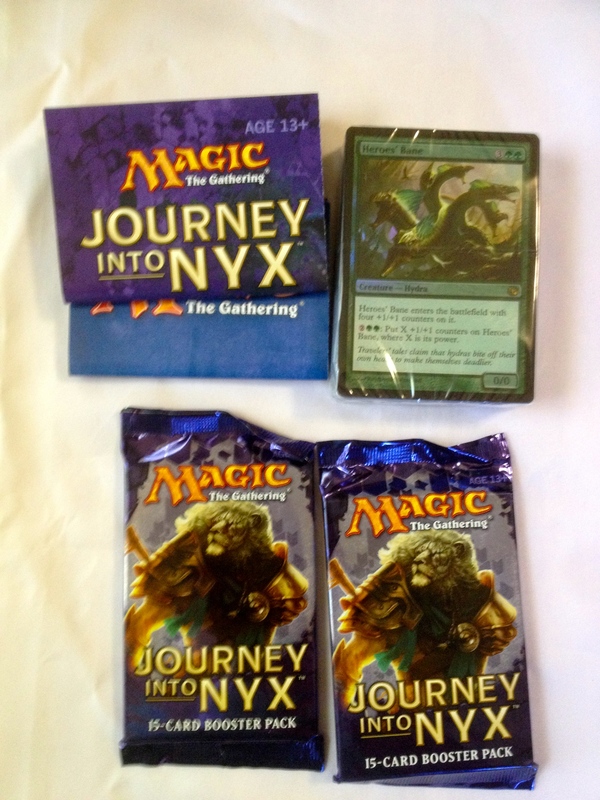 So I have been meaning to do this for awhile…Sorry that I haven’t even reviewed the Journey To Nyx “Defeat a God” Challenge Deck. But it seems a little late. The idea is to have the three decks play against each other! Each deck is a self running machine. But I employed the SpartanSmurfs for help! 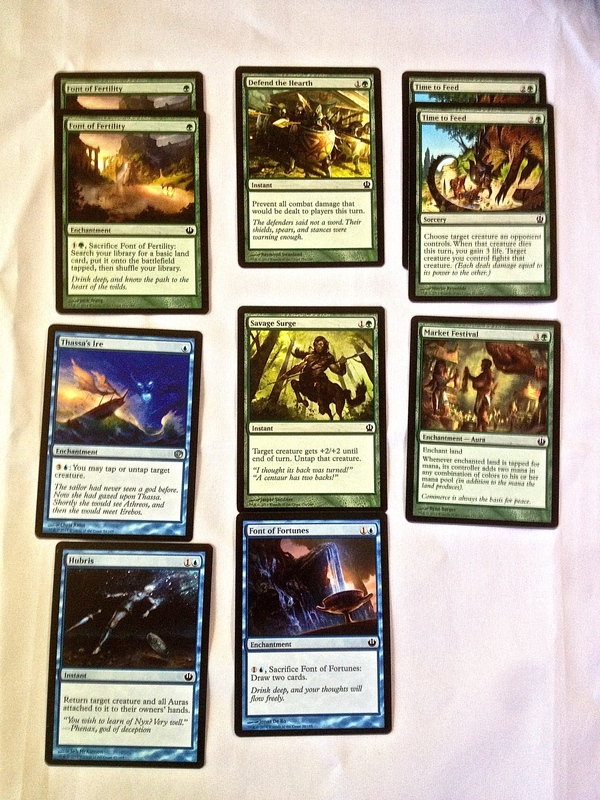 To begin with, I predicted that the Hydra Deck would win because it has beaten me more regularly than the others. I have never lost to either of the other decks. (WAA Waa was.) Was I correct? I thought the Minotaurs would fall first and the God would fall last. 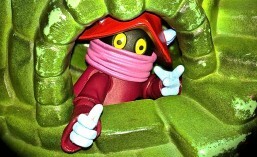 For your entertainment, some pics of MOTU guys with the deck! He-Man, either ready to slaw the Hydra, or representing all of the vibrant life that it embodies..Same as he does. OK. On with the show. 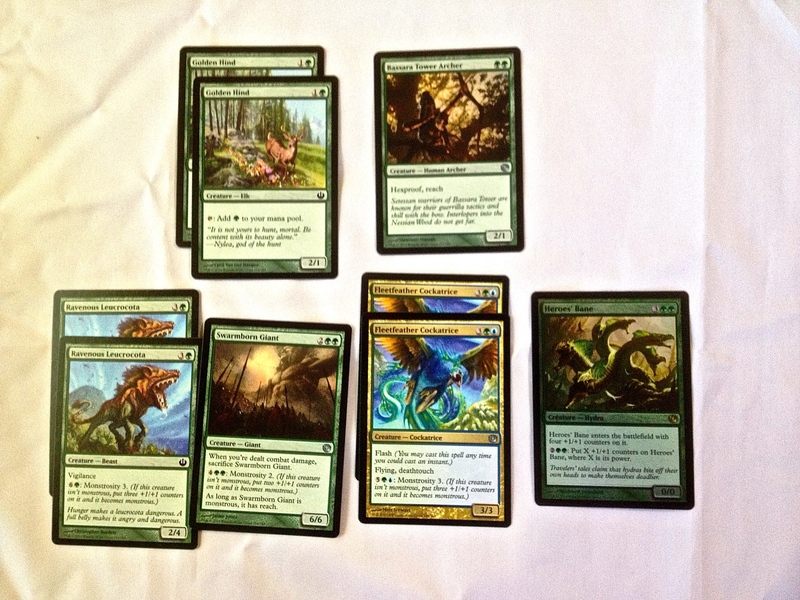 The Hydra had an advantage…The instructions say you can’t mill his deck. On the other hand, the other two decks can “take damage.” You mill the decks for the amount of damage you give them. The minotaur deck seems to be the weakest. And those artifacts that get milled give it a big disadvantage, so it seems…. Well I was COMPLETELY WRONG! The Hydra fell first….and in only like, four turns! Xenagos was able to do it in. Then fifteen minutes later Xenagos took the fall. “Battle the Horde” actually won! The artifacts don’t get life back and stuff like that for the self running decks. So they weren’t a downside at all. And then those minotaurs just crunch in unrelenting. So there you have it. Try it on your own and share your results in the comments! 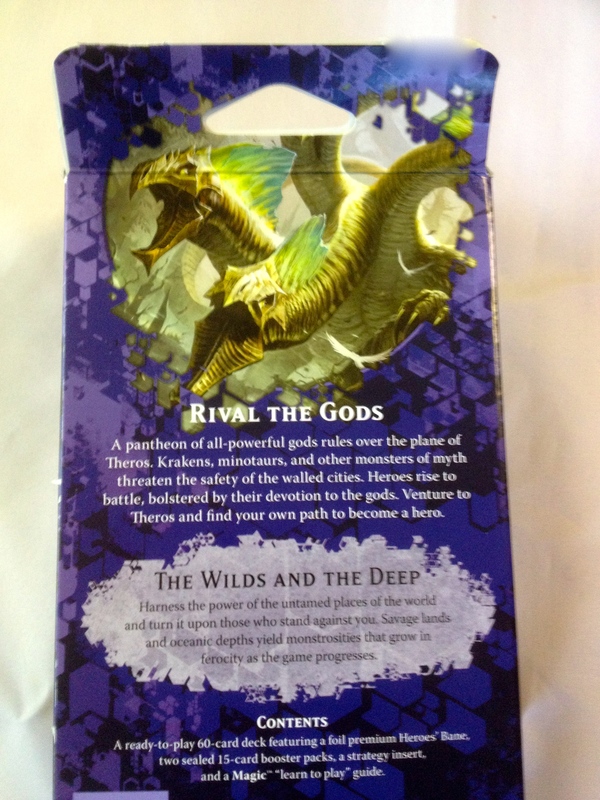 I got a freebie at the Tangled Web Journey Into Nyx Pre-release tournament…”The Wilds and the Deep” starter deck from the new Journey Into Nyx expansion of the Theros Block in Magic the Gathering. I like this color scheme. My color blinded self originally thought this was blue…then after studying it…I saw it as purple! 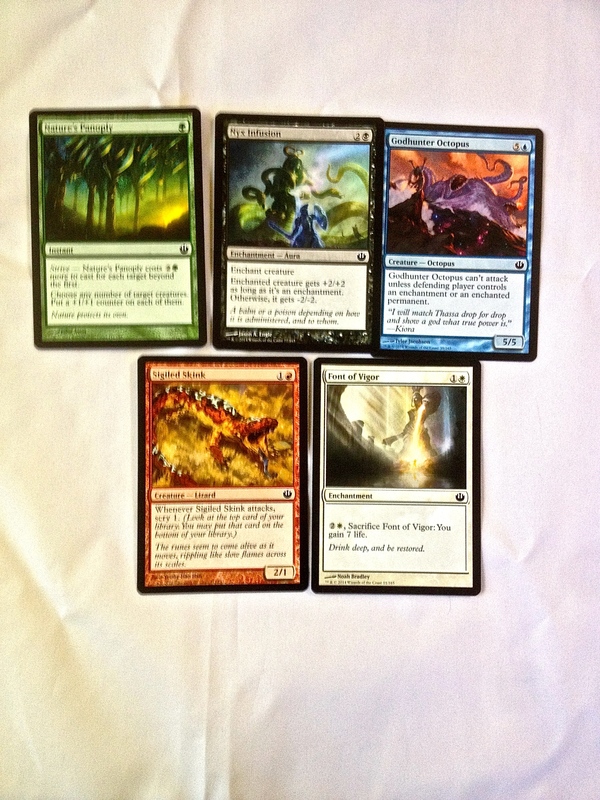 The box showcases a foil promo version of “Heroe’s Bane,” a Hydra card that I knew SpartanSmurf #2 would love! When you open the box and remove the contents, this is what you see. Two pieces of paper, the main deck with cellophane wrap, and two booster packs. 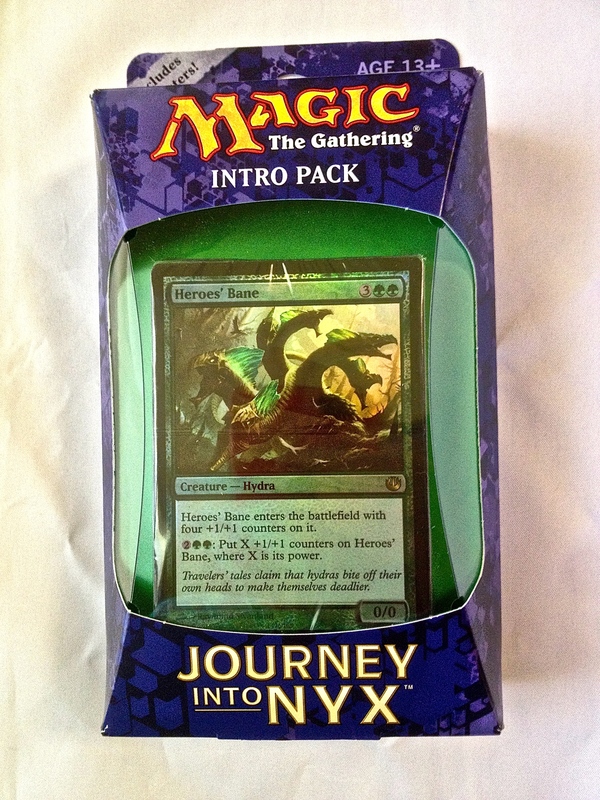 I decided to save the booster packs for last…You all can share in my excitement about getting the new cards! If you have been reading the SpartanNerd Blog regularly, then you know that I threw that blue paper in the trash right away. But this paper is the important one. I really dig the art from this set so far. 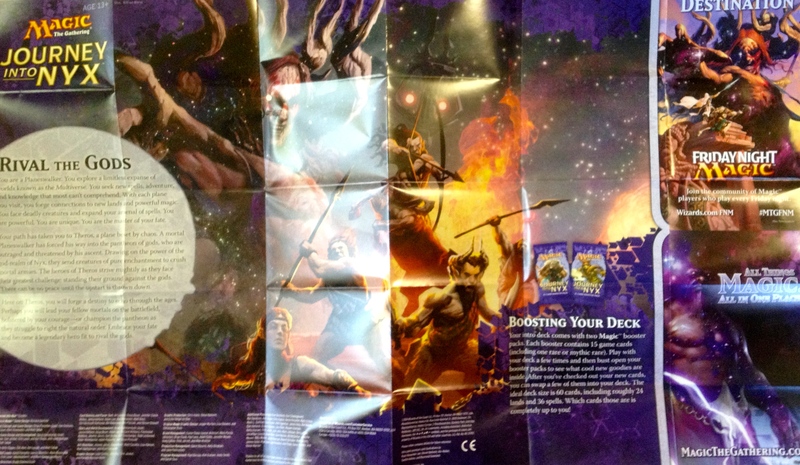 The art on the pre-release pack was cool, and the art in the whole set is generally good. This poster thing shows off some of the best art from the set. Now for a look at the cards. Here are the creatures and the lands. Here are the notable creatures. Golden Hind is a mana chump, Bassara Tower Archer has hex proof, Ravenous Luerocota has Monstrosity, Swarmborn Giant is basically a green Desecration Demon, Fleetfeathered Cocatrice is the oddball of the group. And then Heroe’s Bane, with its exploding counters song and dance. This is a pretty good deck all around. I mean, it certainly can be improved…but that is the point, isn’t it? It is a deck archetype that the wizards suggest and serves as a starting point, especially for a beginner. So I gave the deck to SpartanSmurf #2, knowing that he was going to LOVE casting that Hero’s Bane Hydra and making him huge! Now for something I have never done before. I am going to open my booster packs and slowly reveal the contents to you, Oh Hub City Geeks! Of these, I would like to point out Satyr Gravedancer, one of my new favorites simply because once I wrote a song called “Gravedancer”! 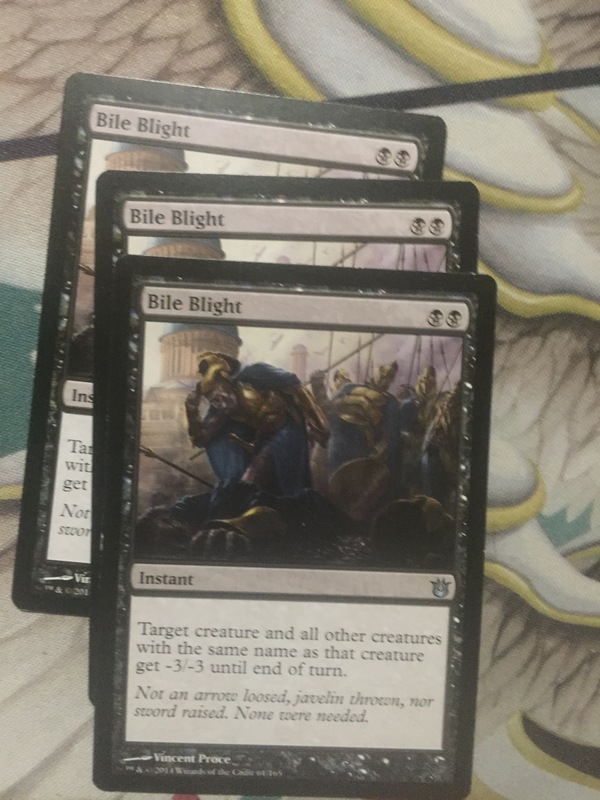 My opponents played Sigiled Skink against me during the Pre-Release. I personally don’t think the Font cards are that good, at least for the most part. You are generally paying more in the long run for something other cards can do faster and better. I guess since Constellation is a big deal, it is good to have access to those abilities as enchantments. The cards in this pack “speak to me” a little more. The white cards really got a boost this time. 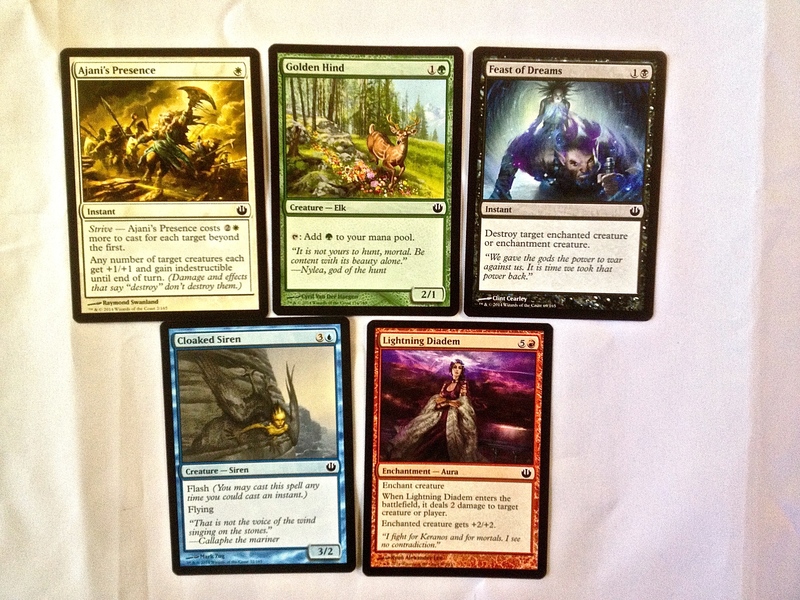 This pack has a few things with Strive, and also Heroic, two mechanics born for each other. I like the Golden Hind, though it’s no Elvish Mystic, and also the Cloaked Siren, who can flash in. The rare in this deck is “Bearer of the Heavens.” A totally unplayable card in Standard. 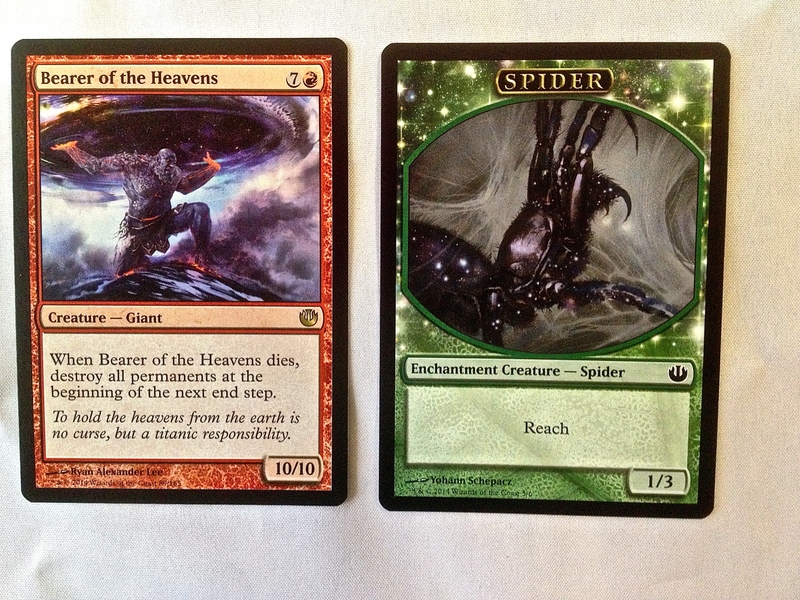 This pack came with a Spider token. What I need is a Snake token! What would you rate “The Wilds and the Deep?” Let me know in the comments!